Overview: Welcome to the Wild West, where the whiskey's always flowing, and the guns are always slinging. Here, anything goes and unlawful men run rampant in the saloons. It's up to you tame the Wild West and to show that your revolver is the quickest draw on this side of town. 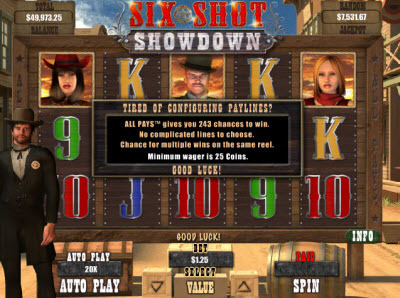 Six Shot Showdown is the slots game where you spin your revolver and win enough gold to not only buy all the cowboys a round of whiskey at the saloon, but the old west saloon too. If you can prove that you have the most accurate aim, win a Shootout where you face corrupt outlaws who need to face the long arm of the law. 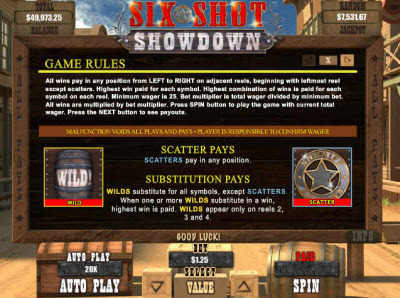 Reap the rewards for each shot and increase the reward money for each desperado brought to justice. Good luck and happy trails, Cowboy. 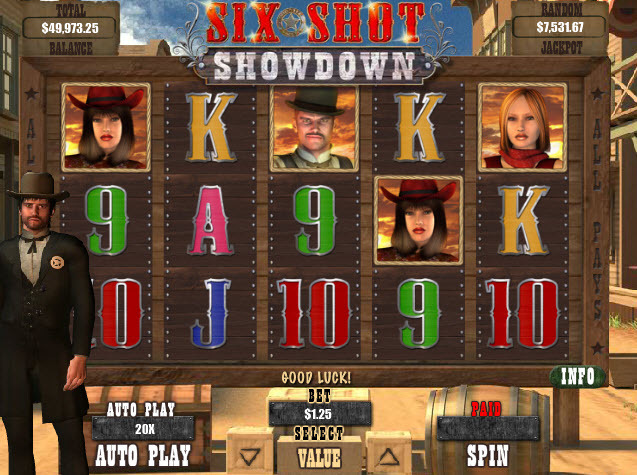 Similar Slots: If you like Six Shot Showdown, you might like these other BetSoft Gaming slots: 2 Million BC, Arrival, Aztec Treasures, Heist, Ned and His Friends, The Exterminator.